e recently had the pleasure to got invited by the IWCS (International Wood Culture Society) to show our work live at the World Wood Day 2017 in Los Angeles. And, please refer to the photos which were concerned to this event. 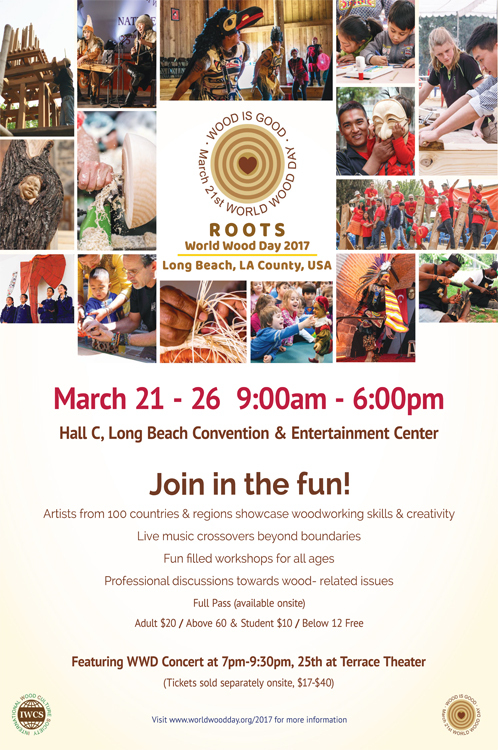 I was invited by the IWCS (International Wood Culture Society) to show our work live at the World Wood Day 2017 in Los Angeles. 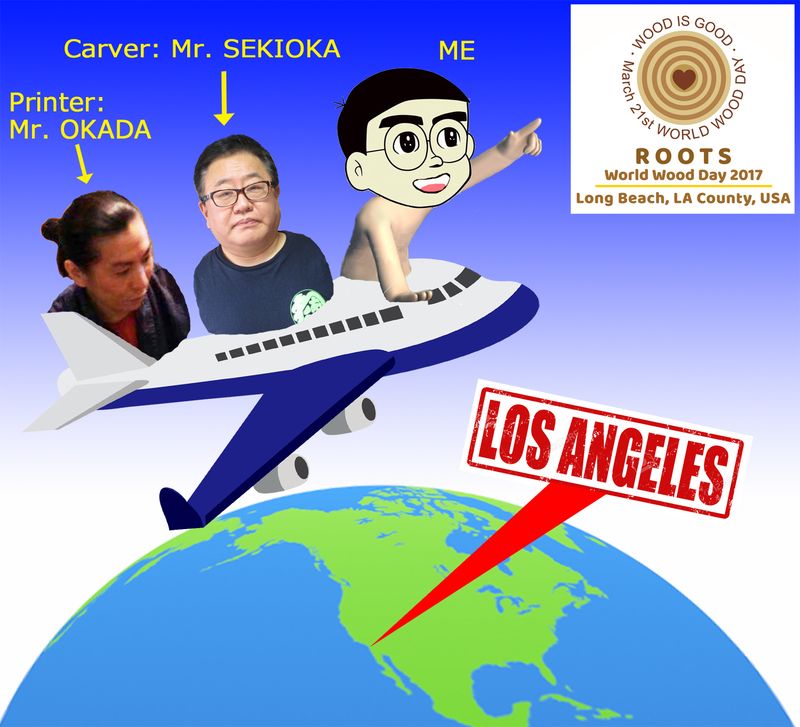 I decided to go there with two traditional craft works of woodblock print, Mr. Sekioka as a carver and Mr. Okada as a printer. We appreciate IWCS bear the cost for our 10 days trip. IWCS is a non-profit, non-governmental international network of wood enthusiasts, dedicated to the research, education and promotion of wood culture. IWCS has held annual event "World Wood Day" since 2013. Many wood craft works and workers are gathered for the event from many countries. The below poster shows the event of this year, World Wood Day 2017 (WWD2017). 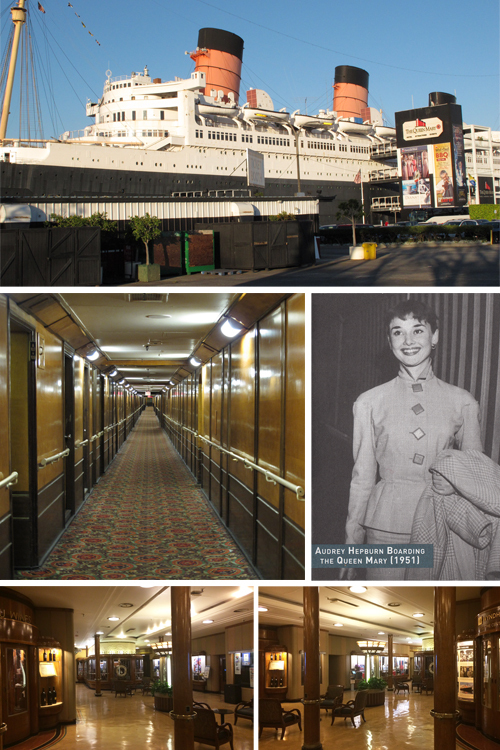 WWD2017 was held in convention center at Long Beach in Los Angeles. 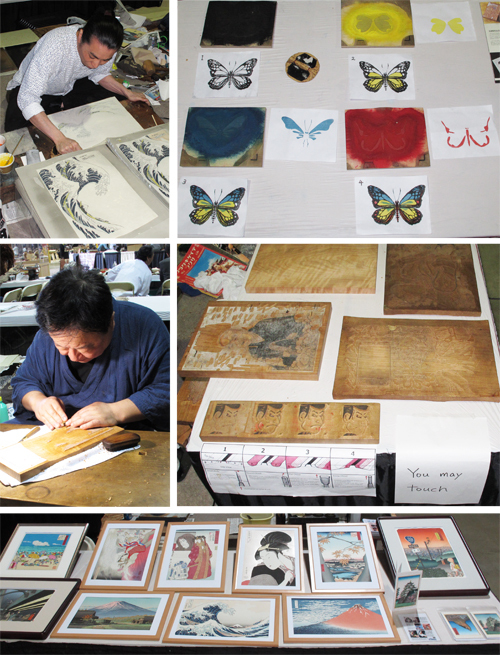 The day after arrival, we prepared our booth to show demonstration and display for woodblock prints. It was hard work to lift up the base floor for craft workers. 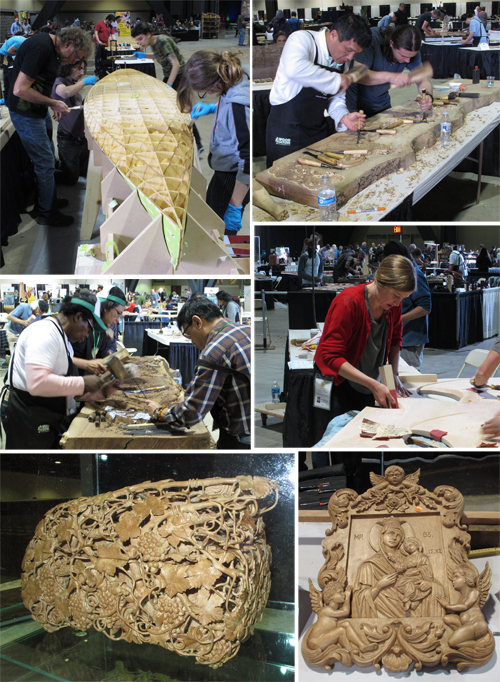 On the next day, many visitor gathered to our booth once craft workers started to work. 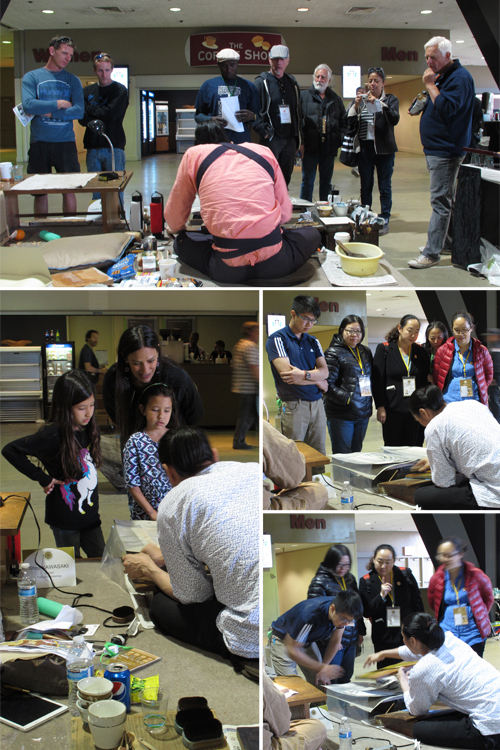 And I made effort to explain the visitors how to make woodblock prints. 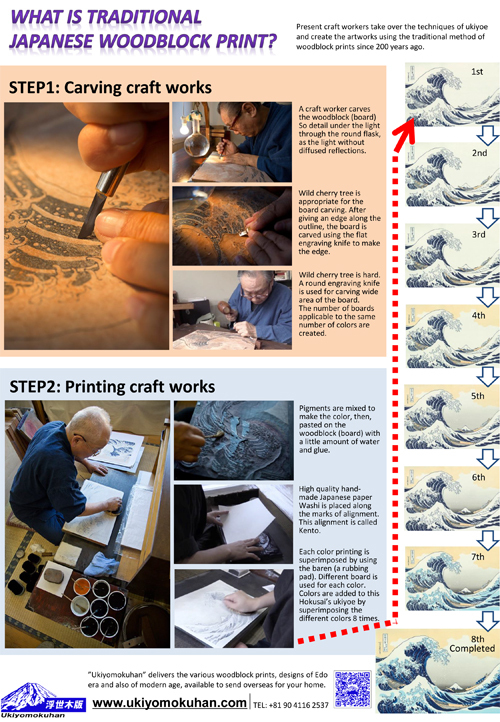 We brought woodblocks to print Great Wave which is very famous Ukiyo-e designed by Hokusai. Once printer start to pint it, many visitors gathered and fascinate with his work. Great Wave is quite useful work for the event like this, because it can be completed by only 8 or 9 times super-impose printing. So, visiter can watch the printing procedure from beginning to end. Not only Great Wave is beautiful, but also it can be made in short time. That is one more reason why Hokusai is called Genius Artist. I respect and appreciate for him. 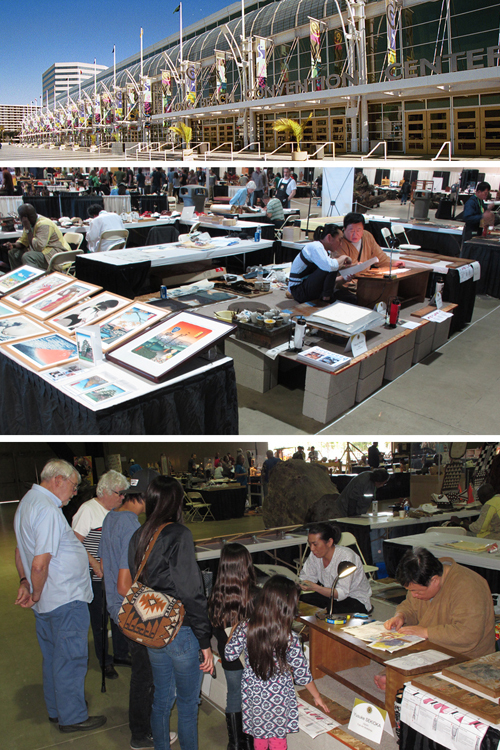 In our booth, some woodblock prints are displayed and some visitors were interested it and wanted to buy them. But, we are not accepted to sell them, because IWCS is a non-profit society. 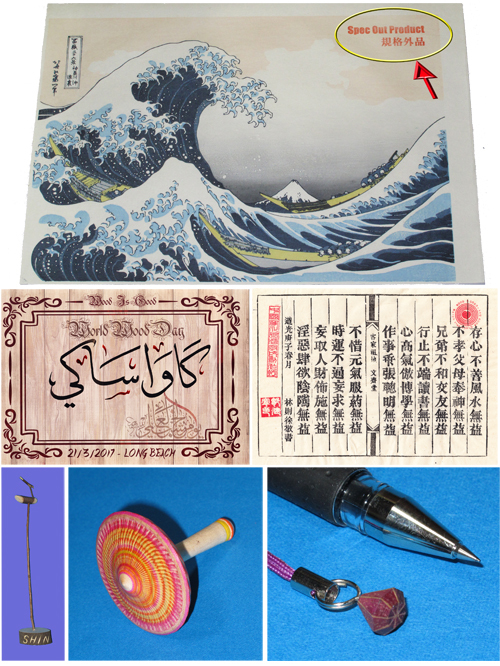 So, instead of that, I gave them a material sheet which shows how to make woodblock prints as below picture. Fortunately, it is described about Great Wave because one customer in Japan asked me to make the material before. And, this material is included contact information for me. After printer procedures is completed, we get woodblock prints completed. But, in this actual environment, it was very hard to do high quality printing as usual. The name of the event was "World Wood Day 2017", which was an exhibition that involved more than 100 countries around the world, introducing handmade wooden products of each country while showing production sites. However, although it is common for any country's work to process wood and add some coloration to complete it, the traditional woodcut of Japan is not that kind of thing. We made several wood-edged woodchips, made 100% washi in a completely different process, and completed by dozens of multi-color rubbing. Although my traditional woodblock booth was very popular, it seems that the fabrication technique that can be said as a different dimension seems like astonishment magic. There wasn't only us from Japan. 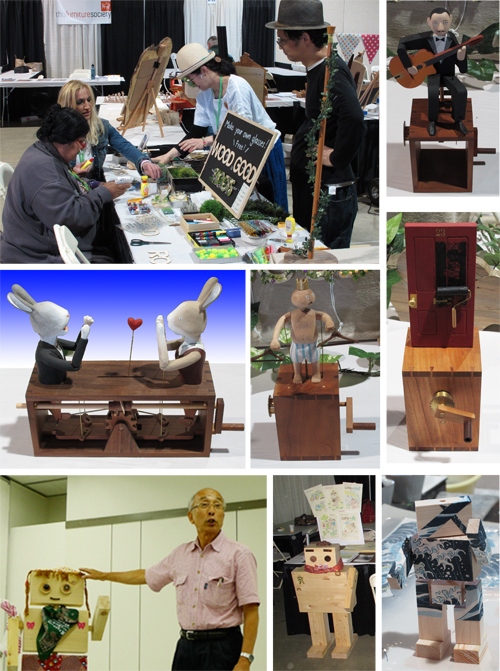 Other Japanese, like Mr. Harada, who is producing a modern style Karakuri doll (AUTOMATA). A lot of humorous dolls, such as those shown in the photo were made. They had events like having participants make decorative eyeglasses. There were also people who were attended by university professors. Shimane University's Professor Akusho Yamashita, who physically analyzed and studied the goodness and badness of Kanna craftworkers, "Robockey" was drawing attention in this event. At the bottom left of the photoyou can see him and the Robockey. Robockey was made of 100% wood, and all parts of the robot needs to be moved manually. Robockey is a forest fairy that appeared in a picture book. As part of tree breeding, I had a look at the picture book, and assembled an about 15 cm ROBOCKY myself. At the event I got a valuable experience at the Los Angel expedition about all the people I met, who came from all around the world and do woodcut prints. I was able to hear various opinions through conversation. The event "World Wood Day 2017" was held in Los Angeles, and this year it is the fifth year in a row. The venues and participating countries and participants in the past 4 years are shown as following. And it seems that this year, it was over 580 of 85 countries. The organizer is IWCS (International Wood Culture Society), but initially it is a somewhat suspicious association. As I thought, it was a truly fruitful association, not only for accommodation expenses, meal fees, but also domestic preparatory expenses, material expenses, transportation expenses, etc. were also paid correctly besite our traveling expenses. 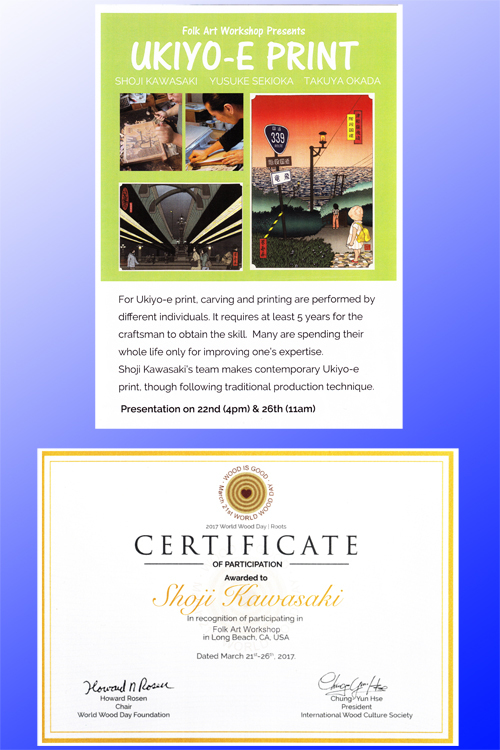 The picture below is PR materials and participation certificates for our booth received from the IWCS. There were also two sides of the craftsman who did not want to ride too much at first, but as I finished, I have learned a lot and I feel like I'm going to say "I want to go again" and I am very pleased. Our traditional woodcut team seems to be highly evaluated by the IWCS staff, and the signs are likely to be offered next year as well. Currently I don't know the country where the event will be hold, but I also want to join happily wherever in the world it will be.